Promising adventure and fun whenever the wind blows, this personalized Hot Air Balloon kite will be specially made for one lucky flyer! 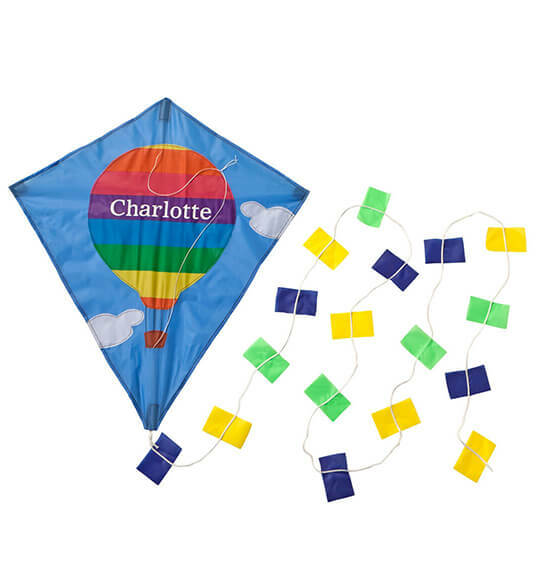 Adorned with a hot air balloon for high-flying style, this diamond-shaped traditional kite is crafted of durable vinyl with strong plastic frame and colorful tail. 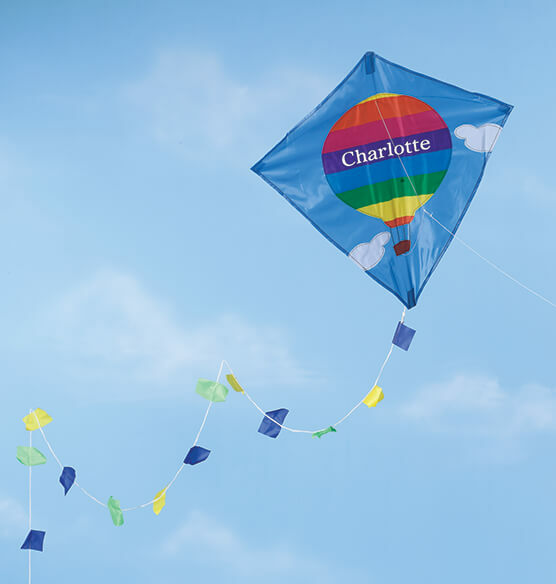 When not in flight, our personalized kite adds a pop of bright color to bedroom walls or playroom. We'll personalize with one special name, creating a keepsake gift. Specify name; limit 1 line, 10 letters/spaces. Diamond kite measures 27" long x 23 1/2" wide with 106" tail; includes flying line. My grandson loves his kite, he couldn't wait go fly it. My granddaughter will high flying and with her name in the sky . . . it get's no better! for my Mom's 90th birthday party. She will be going up in a hot air balloon! i have not seen them in person yet, but plan on using them as decorations for a baby shower and will be a useful thing to use down the road. can you put happy Father's day Greg on the Kite? BEST ANSWER: Thank you for your question. We are not able to alter the pre set personalization on this item. We hope this information will be of help to you. Can a do bride and groom names? BEST ANSWER: Thank you for your question. You can put any personalization you would like as long as it fits in the character requirements. We hope this information will be of help to you.